NEW: back with the shuttle bus to the valley station Lagalb! Different fairy-tale mountain scenery vouchers available online - a perfect gift! 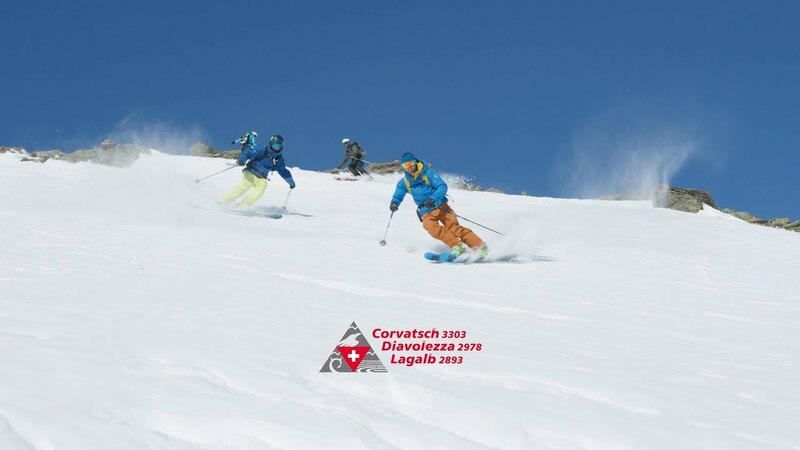 our brand new Corvatsch Diavolezza Lagalb App! With its fantastic views of Lago Bianco, into the Poschiavo valley and further south into the Valtellina, the Lagalb skiing area is an insiders' secret. The Lagalb cable car is a bit like a time machine: as you rise up to 2,893 metres above sea level, you feel you are going back into the past. The charm of Lagalb lies in its remoteness. There is plenty of variety on its slopes – right through from December to early April. Creature comforts are catered for in high season (the cable car only runs in winter) by two restaurants full of traditional charm. Another highlight is the ski touring route from the top station down to La Rösa in the Poschiavo valley below. It is an insiders' tip that the locals really love. The steep descents and undulating slopes are a paradise for freeriders: Lagalb on the Bernina Pass is the Engadin mountain for connoisseurs. The black slope is exactly what daredevils are looking for. The first section just below the top station is the steepest slope in the Alps. This leads to the middle section, which is the steepest prepared ski slope in Graubünden. Depending on your proficiency, it may not just be the magnificent views of the fairy-tale mountain scenery that take your breath away here! The ski run from the Lagalb top station on firn snow down to La Motta in the Poschiavo valley is an insider's secret that is very popular with the locals. At the end of the run, there's a bus to take you back to the Lagalb valley station. Diavolezza is the ski touring mecca of the Alps, because it’s the ideal starting point for tours in the heart of the world-famous Bernina range. From early winter until late spring, ski tourers will find a vast choice of varied touring routes available to them. Whether you are a passionate ski tourer or a beginner, on Diavolezza and Lagalb there are suitable routes for all abilities. For experienced ski tourers, there's the route to the top of Piz Palü. If you like to take things at a more leisurely pace, the route to Gemsfreiheit or into the Val Arlas may be just right for you. For competitive skiers, the permanent ski touring route from the valley station to the top station at Diavolezza – with optional timing – is the perfect place to train. Top-quality powder against a dramatic backdrop: the Diavolezza-Lagalb region is heaven for freeriders. 100 per cent untracked powder: what freerider does not dream of such conditions? The chances of getting top-quality powder away from the piste markers and the safety netting are particularly high in the freeriding playgrounds of Diavolezza and Lagalp. Especially when you are with one of the experienced mountain guides from Go Vertical. If you want to enjoy the most beautiful couloirs and the best powder runs in safety, you are in the best hands – and can rent all necessary equipment, too. In summer, the lake glitters white with the meltwater from the glacier. In winter, when it is frozen, it is black and shimmering. Ice skating on the famous black ice of Lago Bianco is a unique natural experience.